Growing construction market, expansion of metros & airports, upcoming new hotels & shopping malls coupled with increasing urbanization rate are some of the few factors that has resulted in the overall growth of UAE electronic security market. Continuous growth in the construction market, increasing government spending and regulation towards infrastructure development have resulted in wide installation of electronic security systems across UAE. In UAE's electronic security market, video surveillance segment accounted for majority of the market installations and are primarily witnessed across applications such as government & transportation, commercial offices and retail sector. According to 6Wresearch, UAE Electronic security market is projected to grow at a CAGR of 10.7% during 2015-21. In UAE electronic security market, video surveillance system accounted for majority of the revenue share in the overall market followed by access control system and intrusion detection system. In the vertical segment market, government & transportation and commercial offices vertical accounted for major revenue share in 2014. Northern region electronic security market accounted for major share in revenue in UAE's electronic security market in the year 2014 and is expected to generate high revenue over the next six years owing to the Dubai's World Expo 2020. The report thoroughly covers the electronic security market by types, by verticals, and by regions. The report provides unbiased and detailed analysis of the on-going trends, opportunities/ high growth areas, market drivers, which would help the stakeholders to decide and align their market strategies according to the current and future market dynamics. UAE is one of the key growing electronic security markets in the Middle East region. Rising need for intelligent security systems and government initiatives for security are the key factors that are spurring the market for electronic security systems in UAE. In the country, the market is primarily driven by video surveillance system followed by the access control system and intrusion detection system. Also, Dubai is hosting World Expo 2020, where around 25 million visitors are expected to visit the country. For the event, expansion of public infrastructures, construction of trade centers, hotels and shopping malls are anticipated over the next five years. Growth of these infrastructures would result into high deployment of electronic security systems especially in the hospitality and transportation sectors. 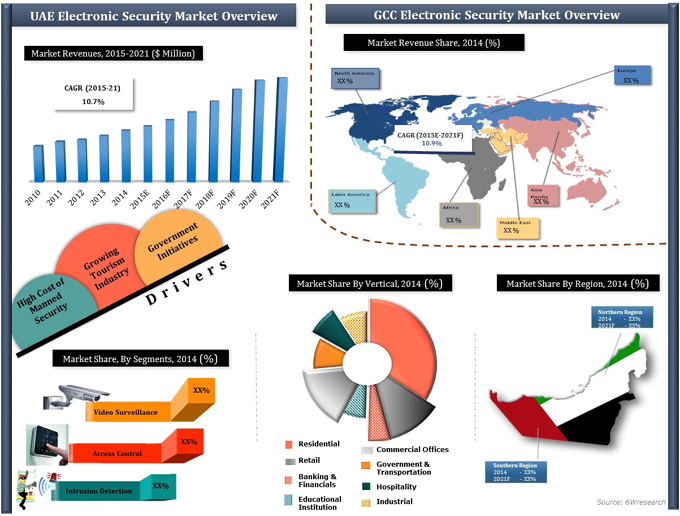 “UAE Electronic Security Market (2015-2021)” report estimates and forecast overall UAE electronic security market by revenue, by type such as video surveillance system, access control system and intrusion detection system, by application, and by region such as northern region and southern region. The report also gives the insights on market trends, company profiles, market drivers and restraints.